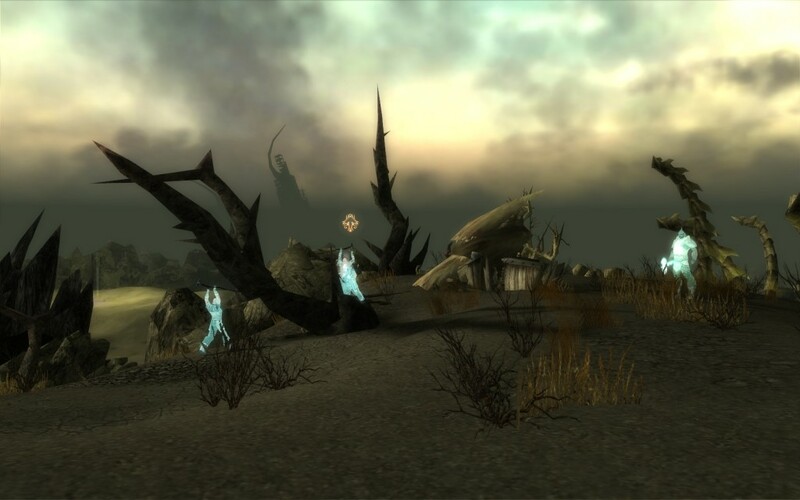 Now that I’m at the final unexplored area of the Desolation, I’m starting to dread what lies ahead. Even as Rajas and I entered the Ruptured Heart, the sight of the Mouth of Torment makes me feel ill. When we fought Varesh, Abaddon’s mask, hand and broken sword were visible. Nearing her defeat, everything was sucked into a portal, which crashed down leaving a huge hole in the Mouth of Torment. I bring this up because in the Ruptured Heart, you can still see the god of secret’s mask, hand and broken sword. Rajas thought this may just be an illusion. 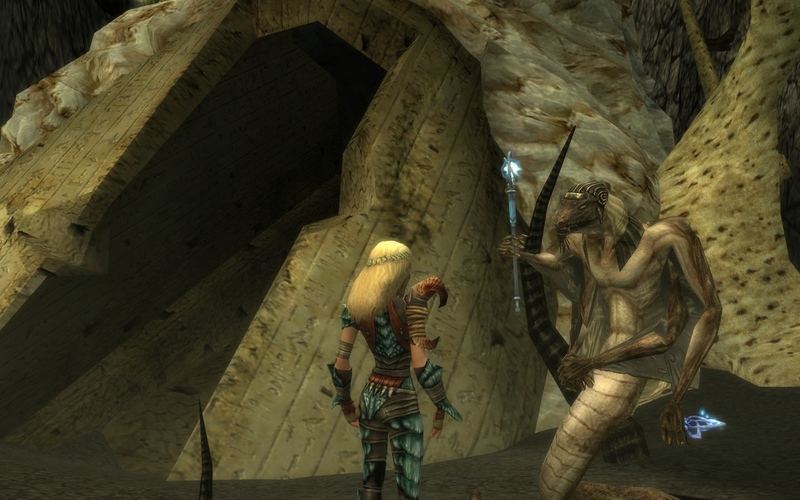 Before Rajas and I headed out into the Poisoned Outcrops, we spoke with Vissh Rakissh; one of the last of his kind in the Lair of the Forgotten outpost. Earlier that day I took his request to help retrieve the Staff of the Mists: a powerful and ancient relic of the past and “twin” to the Scepter of Orr. What the Undead Lich did with the Scepter of Orr is still fresh in my mind, so I couldn’t stand by and let the margonites run loose with its twin. Exploring the Desolation can certainly drain one’s endurance. So it pleases me that Rajas is coming along to keep me company while I search the Shattered Ravines. 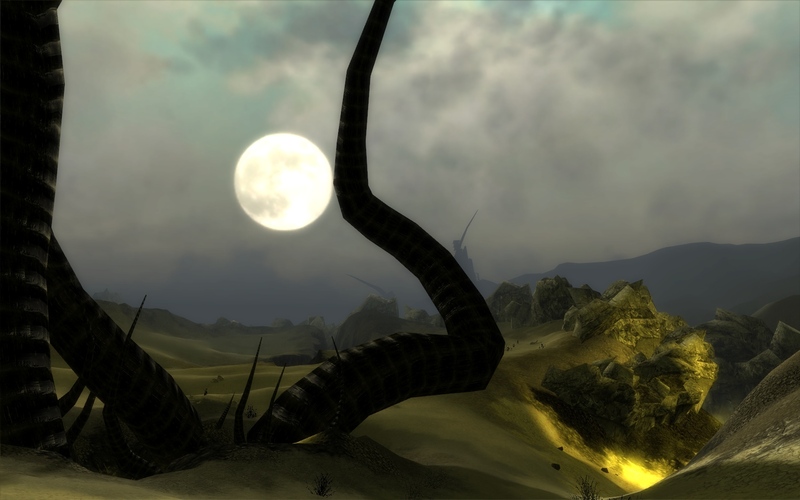 As we left the nearby outpost, large tendrils, a reminder of Abaddon’s corruption, caught our attention. I can see why so many adventurers dislike straying from the beaten path. Even the strongest of warriors succumb to his taint, remaining in a state of madness. Rajas and I have personal items that we keep to reinforce our will to bring him down. Rajas has a miniature grey giant that a child dropped while evacuating from Vabbi. It reminds him of all the innocent lives that we, as adventurers, are committed to protecting. I have a written account (this journal), to remind me of the evils I have triumphed over in the past.